Even fencing in your backyard can be done in a more earth-friendly manner with products composed of recycled materials, such as plastic (typically HDPE) and reclaimed wood fibers. This combination of materials creates a low-maintenance, durable composite fence that is resistant to cracking, rotting, and insect damage. Plus, it offers the look of wood, but doesn’t require painting, staining, or sealing! Matching gates and other fence accessories are offered as well. FenceScape by TimberTech offers a steel-reinforced top rail, for added strength, on its dog-eared and square cut board fencing. It’s available in a Mountain Cedar color. It comes with a 25-year limited warranty and is available through dealers across the country. Fiberon Fencing is made in the U.S.A. It comes in post & rail and 4 3/4″ dog-ear picket styles and is offered in 3 tones: Weathered Pine, Pacific Redwood and Coastal Cedar. The product is available at local dealers across the country and is backed by a 15/10 limited warranty. LifeCycle Fencing from Advanced Environmental Recycling Technologies offers a 25-year limited warranty. Two styles and two finishes are available: A residential grade design in 1/2″ x 5.5″ profile, and a commercial grade design in 3/4″x 5.5″ profile; and Rustic Cedar and Earthtone colors. Get it from dealers in the U.S. and Canada. 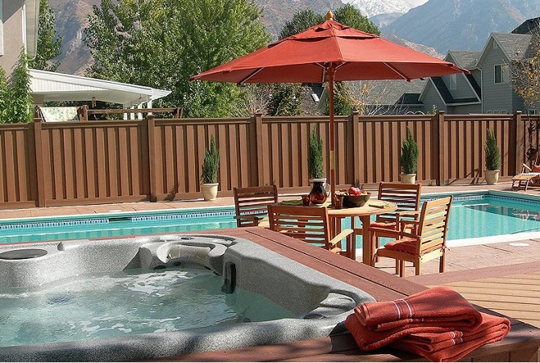 The TerraFence line from Nature’s Composites is available in 6 colors and numerous styles including: Privacy, Board-on-board (overlapping pickets), basket weave (horizontal or vertical), shadow box, picture frame with topper, ranch rail and ornamental styles (typically used around pools). A 20-year limited warranty is included. TerraFence is available at Lowes and dealers in the U.S., Canada & Mexico. Trex Seclusions Composite Fencing (pictured above) comes in interlocking panels for extra strength (will withstand 110 mph sustained winds and 130 mph gusts). Color choices include: Saddle, Winchester Gray and Woodland Brown. A 25-year Residential warranty is included, and it’s available at The Home Depot and other dealers. UltraDeck offers a wide variety of styles in a rich hickory wood tone. Choose from privacy, shadow box, basket weave and scalloped picket fencing styles. These products are made in the U.S.A and available only in the Midwest, near the manufacturer. Woodshades Composite Fencing is available at Lowes and comes in a variety of styles including: Board-on-board, dog-ear privacy, shadow box and ranch rail. Colors include: Rustic Barnwood, Cedar and Redwood. It comes with a 20/10 limited warranty. I’ve seen Trex Seclusions Composite Fencing before, it looks fantastic everywhere I’ve seen it. Very admirable. A neighbor convinced his other neighbor to go through with it after seeing what his looked like. Made his whole yard go together!